In March of 2016, Chuck Christenson of NextWave Consulting was approached by the organizing committee for the Doylestown Memorial Parade to provide funding for the mold, to be used to make a special edition tile commemorating the 150th anniversary of the parade’s running. The tiles will be sold with all proceeds going to local veteran organizations. Below is a letter from the organizing body to fully explain these great commemorative tiles and instructions on how to purchase your own. In 2018, the Doylestown Memorial Day Parade will celebrate its 150th anniversary, making it the oldest such parade in the country. To mark this occasion and to honor those who gave their lives for our freedom, the Moravian Tile Works has been commissioned to design a tile depicting this milestone, with all proceeds going to support our local veterans organizations. Pre-orders for these tiles are now being accepted. 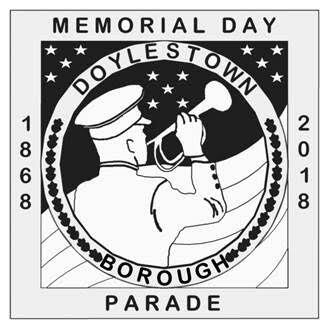 You may download the “Memorial Day Parade Tile” order form (click here) and return it to the Doylestown Borough office, 57 West Court Street. The cost of the tile is $45.00. Payments are accepted in cash, check, or money order payable to the Doylestown Borough. First run orders will be available September 2017. Shipping will be available at an addition charge. Please contact the Parade Marshal, Chris Suessenguth, at MemorialDayParadeTile@gmail.com for additional information or questions about the tile program. I want to personally thank those who made this idea a reality and in so doing, provided this opportunity to not only celebrate this important community milestone, but most importantly, to honor those who defended the freedoms we enjoy today.